I asked our fellow parents of twins what are the most common questions that they receive and their answers might sound familiar. Well, of course, they’re twins! Why else would I have them in a double stroller? Why else would they be the same age? Why else would they be dressed identically? Of course, there’s plenty of other responses that you can have when people ask you, Are they twins? 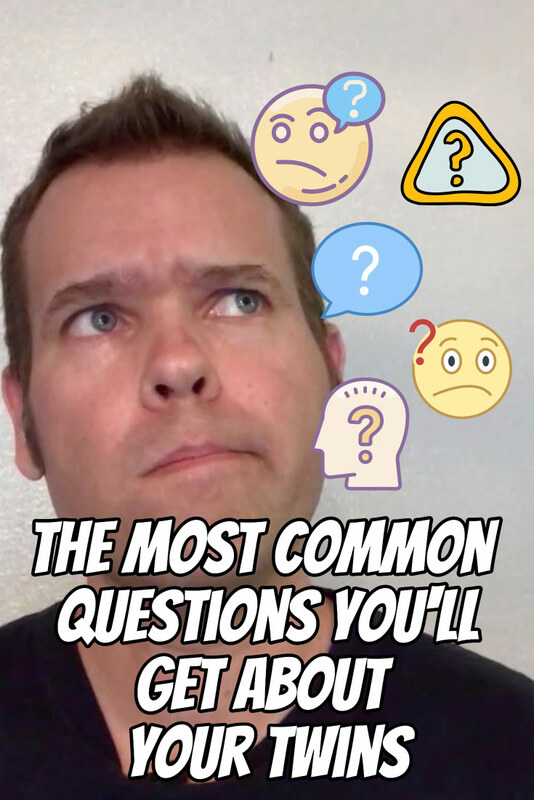 “Yes” is a perfectly acceptable answer, but people may want more information. No, actually they’re triplets, and I leave the ugly one back in the car. No, we’re just pretending. In fact, these are just child actors. You know, they use twins a lot in Hollywood. They’re just actors, and we’re pretending. No, they’re triplets! Wait. One, two… Hey, where’d the other one go? No. Actually, they are cloned through advanced scientific research, or like those clone troopers back in Star Wars. Well, actually, when we went to the hospital to have our baby, they were having an amazing buy-one-get-one-free offer. We took ’em up on that, and we came home with twins. No, actually. This is my child, and this is his stunt double. You know, because kids like to do dangerous things, so we always have this stunt double, just in case. So, while the famous, “Are they twins?” question happens more frequently than any others, it’s usually the icebreaker question that complete strangers come up to you and ask you. Are you sure they are twins? Well, let’s ask my wife, who carried them in her belly. Let’s ask the ultrasound technician. Let’s ask the doctor who delivered them. Did you mean to have twins? Did you mean to have twins? Uh, no. Not exactly. It’s not really something that you plan. 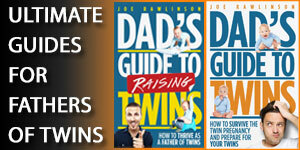 Well, if you’re lucky enough to have boy-girl twins, you know pretty darn well how you tell them apart. Otherwise, there is always going to be subtle differences between your twins, even if they’re totally identical. Wow, so they are twins! Are they natural? Ah, no. Actually, this one is made of aluminum and this one is made of plastic. No, actually, this one is an alien. What’s an artificial twin, anyway? How do I do it? Well, there’s really no other way to do it. I have to do it. They’re my kids, I love them, and we make it happen. So, you have your hands full, don’t you? Thank you, Captain Obvious! I appreciate that observation. So, is it double trouble? Um, yes, most of the time. But it’s also double the fun! That’s the joy of having twins. Oh wait, maybe it’s, maybe it’s that one. Uh, could be that one. Or maybe it’s not. I’m pretty sure it’s that one. Yeah, it’s this one right here. Which twin do you like more? So, which one do you like more? You do understand that they’re sitting right here and can hear everything we say, right? How far apart were they born? Well, my girls were born two minutes apart. Would you like to see their birth certificates to prove that? Yeah, when my wife took the pregnancy test, it came up with those two little lines, and we knew then that it was going to be twins. No, not really. That just means you’re pregnant! When we went to the doctor, we had an ultrasound, and that’s when they dropped the bomb on us. Boom! You’re going to have twins. No. Well, actually, yes, they do now. They run all over the place! 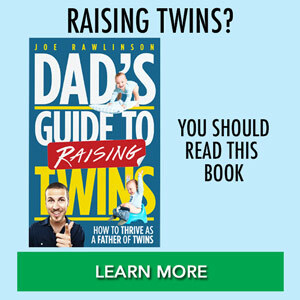 Which twin is the bad twin? 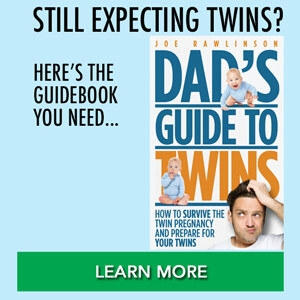 So, which twin is the good twin and which twin is the bad twin? Wait, you do remember that they’re still sitting here, right? So, twins! That’s great! So you’re probably done having kids, right? What did you do to have twins? So, what did you do to have twins? Really? Your mom never explained that to you? Well, let me tell you about the birds and the bees. 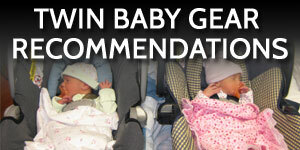 What is your favorite question that people ask you about your twins when you’re out in public? Go ahead and leave a comment and share with us. 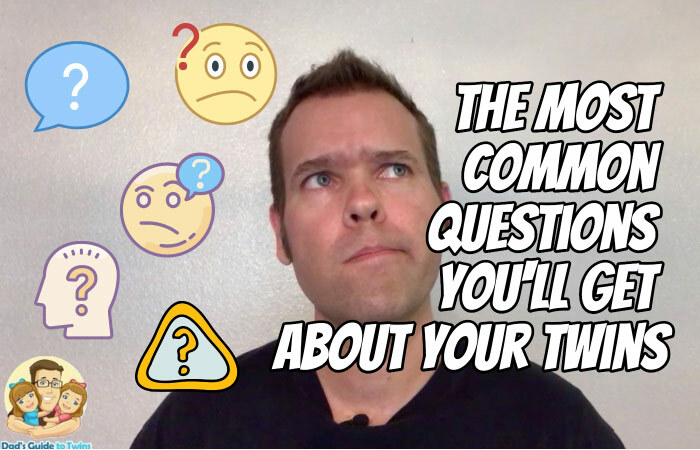 Plus, share some of those favorite responses that you have when strangers come up and approach you and ask rather probing questions about your twins. 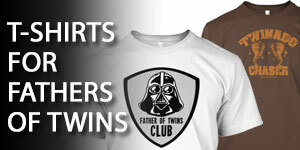 If you want to make it perfectly clear to everyone at the store, that you are a parent of twins, you might as well just wear a shirt that says you’ve got twins. 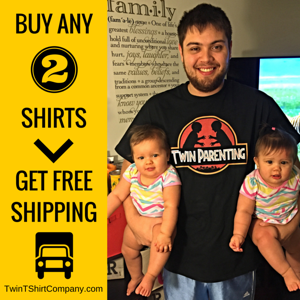 You should get a shirt like this “Twin Parenting” shirt, over at TwinTShirtCompany.com.